There is a (debatable?) rule, in the field of film assessment, which states that a critic should be wary of reaching beyond the text or the frame of a given film when evaluating its merits. Sometimes the situation is black-and-white: if I watched Nicole Holofcener’s Enough Said after not eating a single food item for three days, and then wrote a review claiming that the movie was so excruciating that all I could do while watching it was fantasize about my next meal, I would probably have a hard time justifying that statement to a sane reader. However, there are situations in which some leeway is welcome, perhaps even necessary, and it’s simply impossible to watch, write, and/or think about Enough Said without being aware of the fact that James Gandolfini died three months ago at the age of 51. But there are other actors around this man in Enough Said, and there’s a script with some poignant insights that are worth parsing. Technically speaking, Eva (played with infectious, nervous energy by Julia Louis-Dreyfus), a Los Angeles-area masseuse, is “the protagonist,” in the sense that, whenever the film reaches a structural interlude (the opening credits, narrative turning points later on), Holofcener provides a cleansing montage of Eva at work, drowning out the idle chatter of her clients and reflecting on the fluctuating emotional stakes of her own story. Holofcener finds some clever ways of staging the physical demands of Eva’s job — one client, for instance, never thinks to help Eva carry her mattress bag up a steep flight of stairs — but the character’s main concerns are more personal: she’s still an unattached divorcée, for one thing; for another, her teenage daughter (Tracey Fairaway) is preparing to leave for college. Holofcener’s plot — a touch contrived, but not aimlessly so, as it might seem at first — kicks into motion at a party scene, where Eva is introduced to two people she will become close to: Albert (Gandolfini), a TV historian who will soon ask Eva to have dinner with him; and Marianne (Holofcener regular Catherine Keener), a poet who will soon enlist Eva’s services as a masseuse. Albert, it turns out, has a good deal in common with Eva: he’s also divorced, and he also has a teenage daughter (Eve Hewson) preparing to leave for college. (A curious cross-country detail: both daughters are headed for New York City-based schools.) Though it takes a few dates for Eva to warm up to Albert on a romantic level, their common life experience, and their compatible senses of humor, makes their first date something of a grand success. The catch here, if you’ve seen the trailer (if you haven’t, it’s a slight spoiler), is that Marianne is, in fact, Albert’s ex-wife — a piece of information that Eva unwisely chooses to keep to herself for a substantial period of time. For a film with such a wealth of generous, satisfying conversation between two people on the verge of falling in love, the plot device of having Keener’s blasé poet jeopardize a clearly harmonious relationship is initially troublesome. But as Holofcener’s situation develops, and as the characters continue to breathe, it becomes clear that Enough Said, much more so than the standard romantic comedy-drama about middle-aged people (if there is, indeed, a standard for such a genre), is an illuminating and often quite serious film about the difficulties of finding love after a divorce. 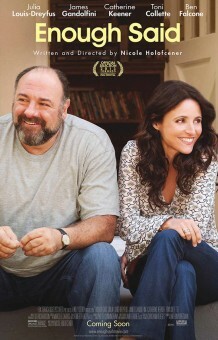 Gandolfini can’t connect with his daughter; Louis-Dreyfus transfers her maternal insecurity into a problematic relationship with one of her daughter’s friends; Louis-Dreyfus chooses to exploit Keener’s inside information as a defense mechanism, so she doesn’t once again fall for the wrong man — this entire network of conflict, of heated relationships, is the result of two broken marriages. Enough Said doesn’t much change my stance on Holofcener as a director — I continue to come up mostly blank when trying to locate interesting things about her films’ visual patterns and approaches — but it is an ample, genuinely moving story about the budding relationship between a man and a woman, which is a rare and not-at-all-regressive step for a female filmmaker whose work (Lovely & Amazing, Friends with Money, Please Give) is so often predicated on characters of her own gender. That she landed on Gandolfini as the actor to lend Enough Said its male dimension is a stroke of perfection: even putting aside, for a moment, Gandolfini’s passing, it’s abundantly clear, from the excellence of his recent work, that Gandolfini had reached a special point in his development as a screen performer. If his 2012 hat trick (the aforementioned Killing Them Softly, Not Fade Away, Zero Dark Thirty) was all about film-elevating, never-showy supporting performances, Enough Said represents a natural progression of those instincts into the spotlight of a leading man. Enough Said hits theaters in New York and Los Angeles today and will begin expanding to other locations on September 27th.